Color Pencil Portraits -- Step-by-step instructions for creating portraits in colored pencils. The Proportions of the Head -- The key to drawing realistic portraits is an understanding of the scale and position of the facial features in relation to each other. Drawing Short Hair in Colored Pencil -- John Middick demonstrates his techniques for drawing short hair. He provides helpful tips for achieving a convincing, organic look as well as advice for accurately depicting blond hair. OnlyPencil Tutorials -- Lisandro Pena's blog includes pencil drawing tutorials for "Drawing the Human Eye", "Drawing With a Grid", "Negative Drawing" and more. Drawing Tutorials and Tips -- Brian Duey's online drawing tutorials focus primarily on drawing facial features and creating life-like portraits. His tips for attaining a wet, reflective look when drawing eyes are especially helpful. How To Draw Animals -- Follow along and learn techniques for drawing animals in a variety of media: oil crayons, color pencils, chalk pastels, gouache, pencil, and charcoal. How to Draw Realistic Hands -- This helpful guide gives tips for drawing hands and includes anatomical drawings of bones, muscles, joints and their proportions. 15 Expert Tips on How to Draw People -- A free instructional eBook with images from Anthony Ryder's book, The Artist's Complete Guide to Figure Drawing. Drawing Portraits with Charcoal & Chalk -- Step-by-step instructions for drawing portraits. Learn How to Draw -- Several artists share step-by-step demonstrations and drawing techniques for a variety of subjects. Dragoart Drawing Tutorials -- Learn how to draw mythical creatures: dragons, fairies, unicorns, wizards, monsters, vampires, mermaids... and a whole lot more. Pencil Drawing Lessons -- Carol Rosinski provides drawing lessons and discusses her techniques for achieving very realistic results in graphite. Amazing Illusions Will Help Your Realistic Drawing -- JD Hillberry demonstrates how to use drawing tools such as a value finder and blending cloths. 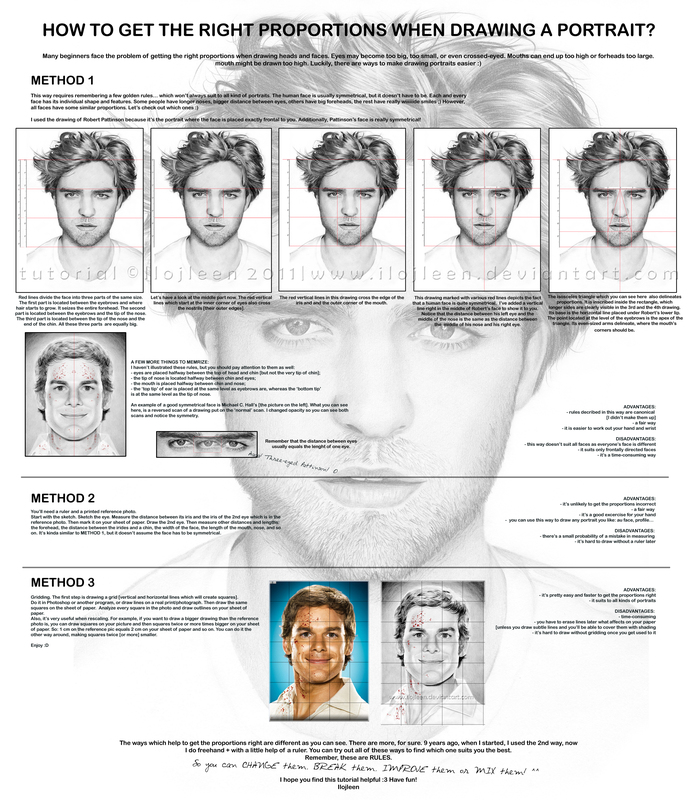 How to Get the Right Proportions when Drawing a Portrait -- Ilojleen explains the basic proportions of the face and its features. She also provides 3 approaches to creating a portrait drawing - pointing out the advantages and disadvantages of each one. Tutorial: Proportions -- Nicolien Beerens explains the 5 drawing techniques she uses to ensure accurate proportions. Tutorial: Shading and Blending -- Nicolien Beerens provides techniques and tips for shading and blending the dark and light areas in your drawings. How to Draw People -- Kirk Bjorndahl explains how to draw the human body. Topics include: proportions of a typical human body, basic muscle structure, and drawing the body and face at various angles. Figure Drawing -- Artist Tenaya Sims provides a thorough explanation of rendering the figure using brown, red, and black pencils to establish color temperature relationships. Key points emphasized include: capturing the movement or gesture of the pose, focusing on the most critical aspect of the pose, working from the broad to the specific, establishing and maintaining accurate value relationships, controlling direction of strokes/hatching, and paying special attention to the 'planar' qualities of hands and feet. All About Drawings -- Features contour drawings that you can use as templates to easily create your own pencil drawings. Subjects include: cartoons, cars, animals, flowers, and more. Colored Pencil Demonstration of a Flower -- Kristy Kutch explains the step-by-step process she uses to create her colored pencil drawings. Drawing Fur with Colored Pencils � Step-by-Step -- Ewelina Kuczera demonstrates her process for drawing a dog's fur in this portrait tutorial. Painting with Colored Pencils -- Barbara Newton discusses grisaille, juxtapositioning of colors, and preserving the white of the paper. Pen and Ink Drawing Techniques -- Drawing lessons that explain various techniques for creating tones and textures: Cross Hatching, Stippling, and Ink Washes. Linear and Aerial Perspective -- Learn how to use perspective in your drawings. Learning To Draw Buildings -- Jim Stilwell offers a free easy to follow course on Architectural Illustration techniques. It includes basic perspective lessons, tips on drawing from a photograph, and the basics of watercolor painting. He also has a section on how to photograph architecture. Learn-to-draw-expressively.com -- Doug Boomhower provides tips for drawing people, pets, and caricatures in charcoal pencil. Sections are dedicated to drawing difficult areas like hands, eyes, and clothing. The site has many excellent examples of fine art portraiture. Drawing Factory -- Learn how to draw everything from popular cartoon characters to realistic portraits with step-by-step instructions. How to Draw Cartoons -- Learning how to draw has never been so fun and easy! Improve your technique in record time with simple step by step cartoon drawing lessons. How To Draw Funny Cartoons -- Martin Bérubé's website is for anyone who wishes to learn how to draw cartoons characters, animals, cars, planes, etc. His vector drawing tips are particularly helpful. DrawingCoach.com -- Mitch Bowler's step by step written tutorials and videos are designed to help people new to drawing learn how to draw - everything from flowers to portraits to cartoons. How to Draw and Use a Value Scale in Your Artwork -- John explains the different types of value scales and why they are important in practicing your drawing skills. 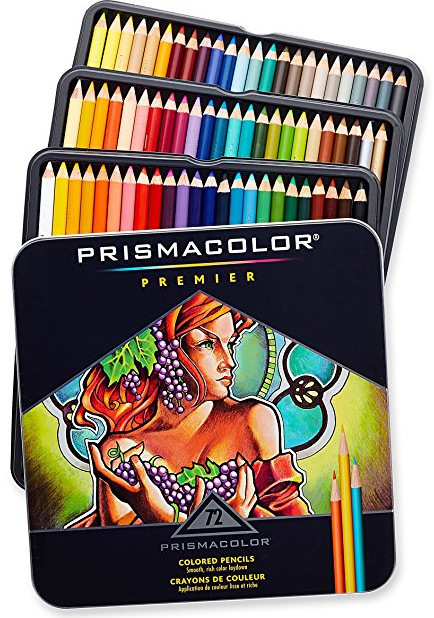 Color Pencil Tips & Techniques -- Advice from Carol Moore. Drawing: Instructional Notes, Tips and Techniques -- Keene Wilson provides key points gathered from instructors and professional artists on Construction, Planes, Anatomy, Edges, Reflections, Perspective, Depth, Form, and the Figure. 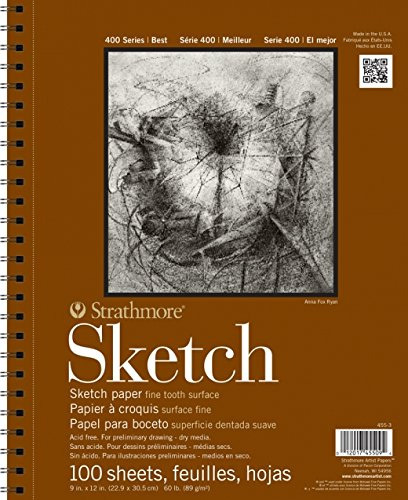 All About Drawing Papers and Surfaces -- Explains the difference between acid free and archival papers and discusses qualities that artists should consider when choosing a paper, such as weight and texture. What is Archival Paper? -- Explains what archival paper is exactly and what it means for artists. Learn what causes paper to deteriorate over time, and get tips for preserving your artwork (how you should store your artwork). If you are intrigued by artists' abilities to capture those elusive qualities and characteristics that make a portrait so incredibly realistic, you won't want to miss these effective techniques. 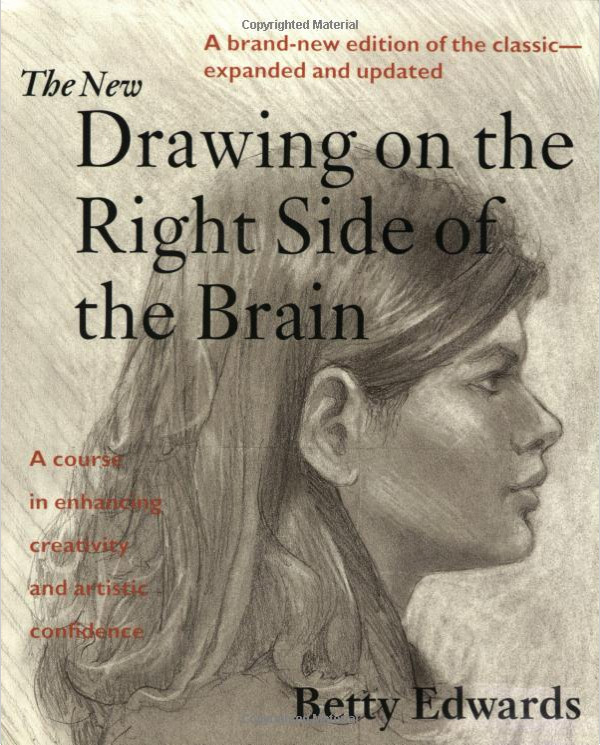 This essential book teaches the underlying principles of drawing, and comes with a DVD to underscore the lessons and techniques presented. Learn to create brilliant hyper-realistic colored pencil paintings with Alyona's unique color layering techniques and use of odorless solvents. Teaches the "how-tos" of drawing: composition, proportion, shading. Helpful step by step demonstrations with highlighted hints sprinkled throughout the text. Teaches about layering, lifting, color interactions, error corrections, light and much more. 29 step-by-step demonstrations show you how surprisingly easy it is to render all your favorite animals, including cats, dogs, birds, rabbits, hamsters and more. Botanical Portraits with Colored Pencils This botanical illustration guide shows how to work with water-soluble and oil-based colored pencils to create detailed drawings of flowers, foliage, fruits and vegetables.